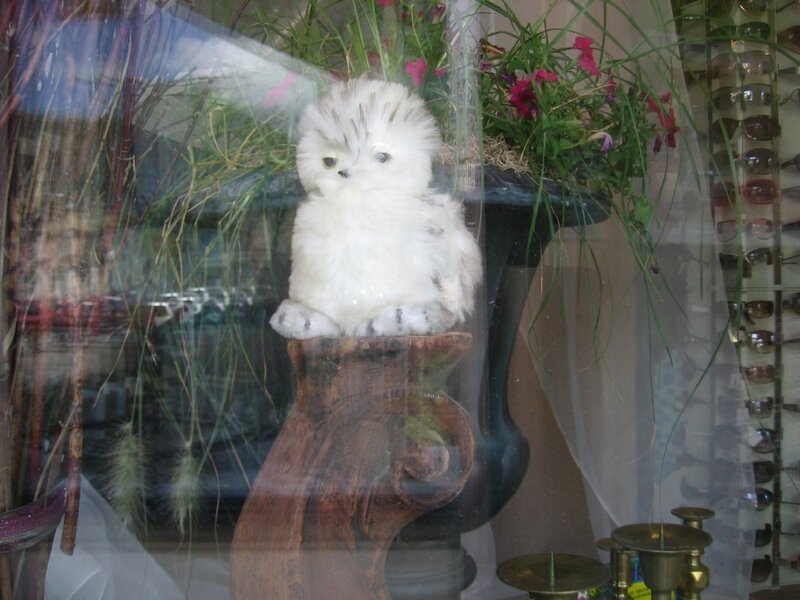 There seems to be an owl in Mary Rossing’s window (that would be Present Perfect on Division Street). A few doors away, in Jerry Bilek’s window (at Monkey See, Monkey Read), there are giants spiders. What’s going on here? Well, in case you’ve been out of touch lately, the seventh and final book in J. K. Rowling’s popular (to understate it) series of Harry Potter books will be released at midnight next Friday, July 20th (okay, technically it will be Saturday, July 21st) and there’s a bit of a buzz surrounding the event. In downtown Northfield, there’s a number of activities planned for the big day. Two of our bookstores, River City Books and Monkey See, Monkey Read, will have parties including characters such as Mr. Ollivander and Gilderoy Lockhart, in anticipation of the release of the book at both stores. ArtOrg will show a video about the illustrator of the books, Mary Grand Pre, an outdoor costume contest will be held, the Contented Cow will host a Potter-themed open mic, the first movie in the series, “Harry Potter and the Socerer’s Stone” will be show outdoors on Division Street, Tiny’s Dogs All Day will sell hot dogs to hungry readers, the popcorn wagon will hold special late-night hours in Bridge Square, and many retailers will stay open late. The 300 and 400 blocks of Division Street will be closed off to accommodate the hundreds of Potter enthusiasts that are anticipated. It will be a truly unique event in downtown Northfield and everyone is invited. So next Friday, from 6 pm to about 1 am, come on down(town) and join the fun. We will start the first human chess game with chess masters Ben Ludescher and Paul Carpenter at 7 pm on Division Street in front of Present Perfect (419). They will play “speed chess” which means that games shouldn’t last for more than 10-15 minutes. If you or your young potter fans would like to participate as a chess piece come by and sign up for the next available space. Everyone who participates gets a treat! Also, boxes of Bertie Bott’s every flavor beans will be on sale all night so you can spend the evening eating jelly beans the flavor of vomit, earthworm, pickle, rotten egg, and boogers, ear wax, soap and sausage!! YUM See you downtown. Opps, almost forgot about Madame Hooch who will be in charge of Quidditch Races (six-legged!) at 8:00 p.m. Grab 2 friends and your quidditch goggles and take a wild ride down Division Street!